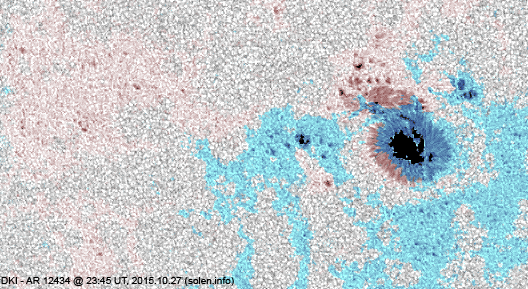 Last major update issued on October 19, 2015 at 05:40 UT. Updates may be incomplete until October 25. The geomagnetic field was quiet to minor storm on October 18. 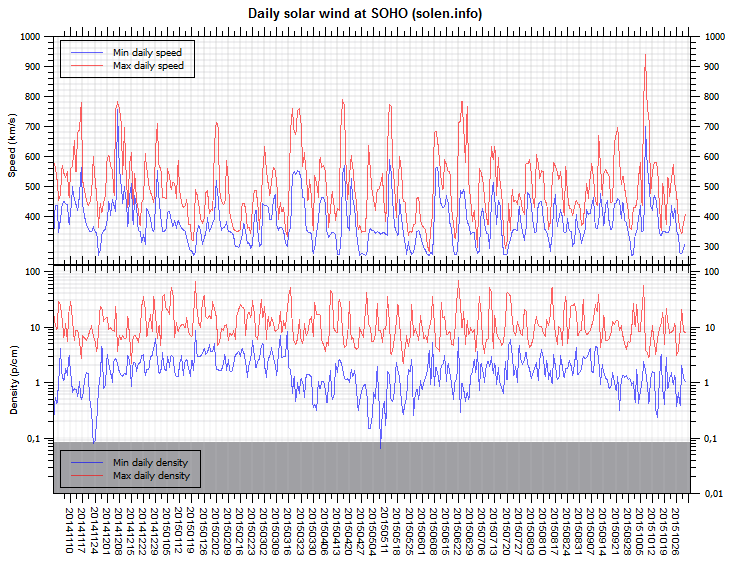 Solar wind speed at SOHO ranged between 335 and 358 km/s. 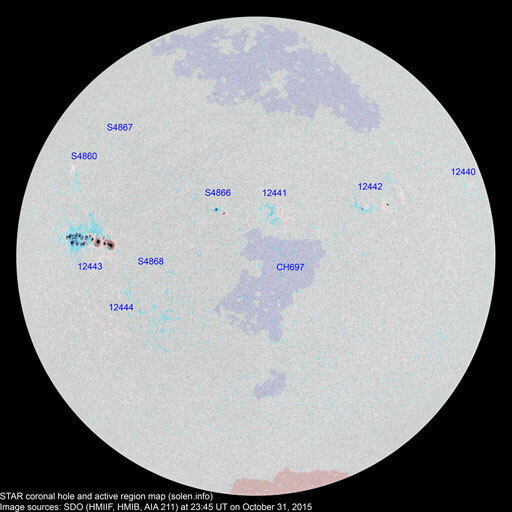 A disturbance that began early in the day was likely associated with the southeasternmost part of CH695, a section which was Earth facing on October 14. 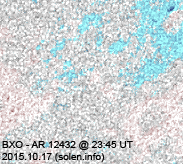 Solar flux at 20h UTC on 2.8 GHz was 119.5 (increasing 16.1 over the last solar rotation). 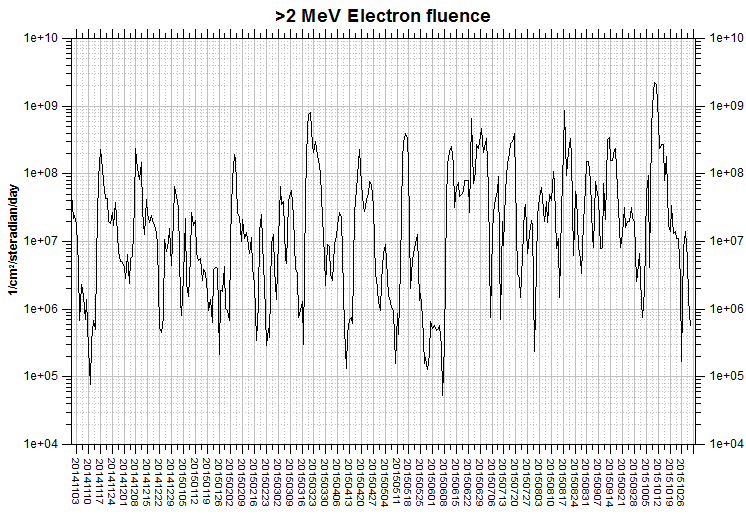 The 90 day 10.7 flux at 1 AU was 102.6. 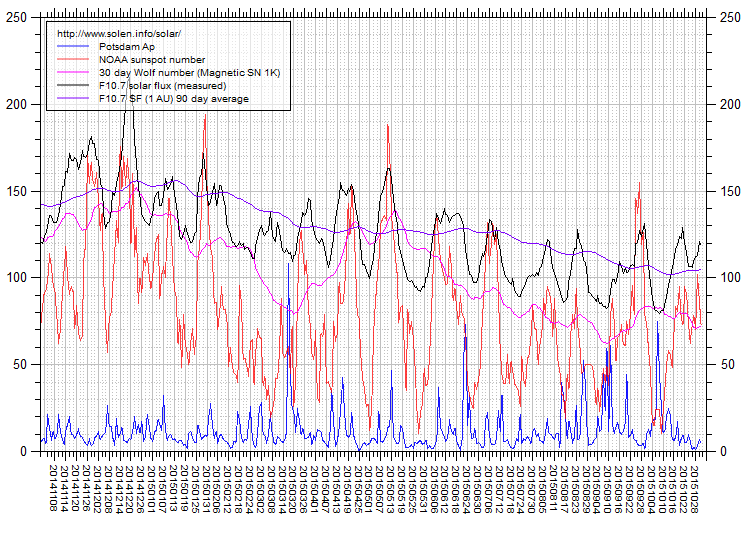 The Potsdam WDC planetary A index was 17 (STAR Ap - based on the mean of three hour interval ap indices: 16.6). 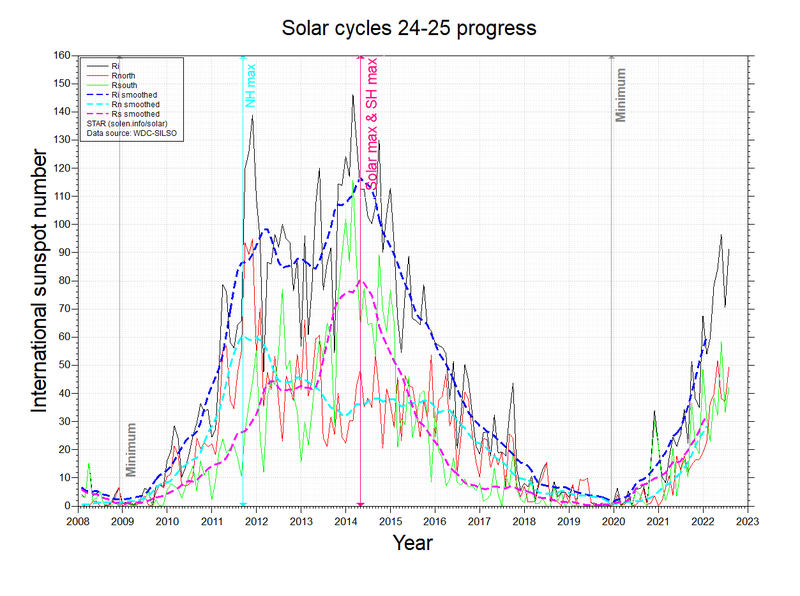 Three hour interval K indices: 33353322 (planetary), 33454322 (Boulder). 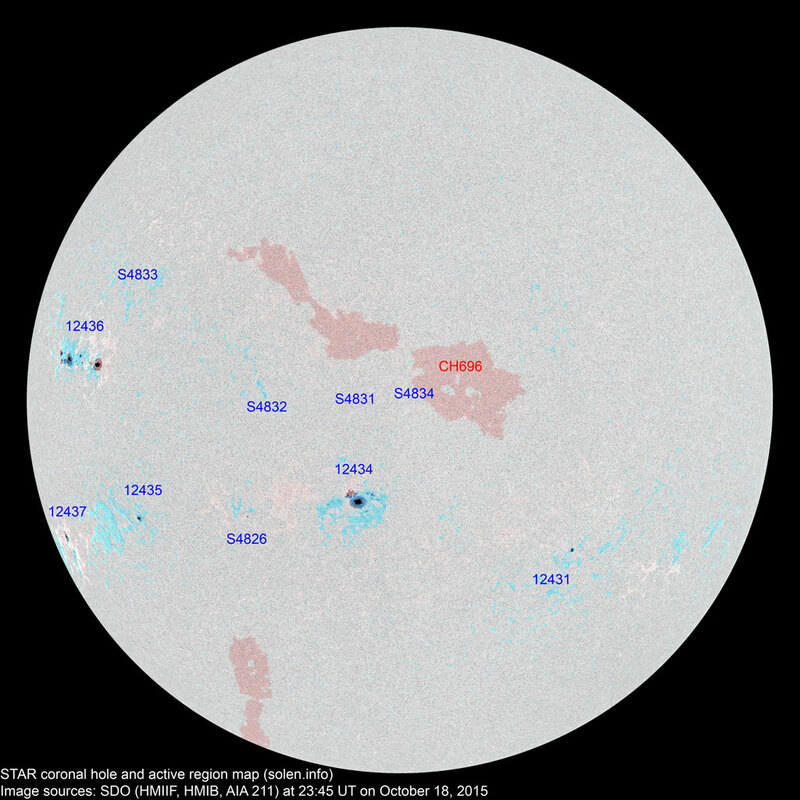 At the time of counting spots (see image time), spots were observed in 10 active regions using 2K resolution (SN: 196) and 9 active regions using 1K resolution (SN: 136) SDO images on the visible solar disk. Region 12431 [S18W28] decayed slowly and quietly. Region 12434 [S10E07] was mostly quiet. There is a weak magnetic delta in a penumbra just north of the largest penumbra. Region 12435 [S14E46] was quiet and stable. 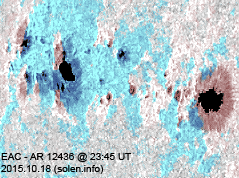 Region 12436 [N09E59] developed with new flux emerging in the central and trailing spot sections. An M class flare is possible. New region 12437 [S20E72] rotated quietly into view. This region was very active on October 16-17 but must have lost some of its complexity before rotating into view. S4826 [S13E26] was quiet and stable. New region S4831 [N09E07] emerged with a tiny spot. New region S4832 [N11E21] was observed with tiny spots. New region S4833 [N18E50] was observed with a tiny spot. New region S4834 [N09W03] emerged with tiny spot. October 16-18: No obviously Earth directed CMEs were observed in available LASCO imagery. 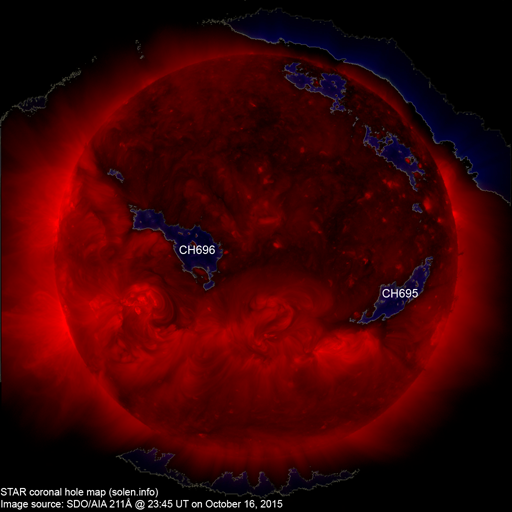 A northern hemisphere coronal hole (CH696) was in an Earth facing position on October 17-18. The geomagnetic field is expected to be quiet to unsettled on October 19. Quiet to active is possible on October 20-21 due to effects from CH696.